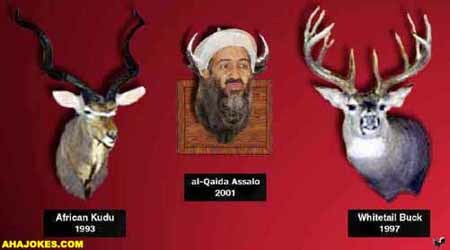 This hunting season, let's catch an Osama! 11:00 - "Third Rock From the Sand"
8:30 - "The Price is Right If Usama Says It's Right"
11:00 - "My Two Baghdads"
12:00 - "The Bedouin Bunch"
8:30 - "When Northern Alliance Attack"
11:00 - "Let's Mecca Deal"
12:00 - "Moammar & Mindy"
9:00 - "Captured Rebels Say the Darndest Things"
10:00 - "No-witness News" 11:00 - "Who's Goat Is it Anyway?" 12:00 - "This Old Tent"